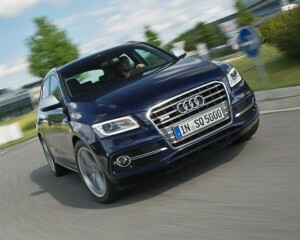 Audi fans are in for a treat with the launch of the firm’s first diesel fuelled ‘S’ model – the SQ5 TDi. The high performance SUV uses Audi’s latest 3.0litre V6 BiTDI engine which will return about 41.5mph. The eight speed Tiptronic auto gearbox will reach 62mph in just 5.1 seconds. The engine is producing maximum power between 3,900 and 4,500 rpm and drivers will feel a difference in the vehicle’s handling. That’s because it’s 30mm’s lower than the standard Q5 and has an exclusive ‘S’ sports suspension. There’s also the optional Audi drive select adaptive dynamics system for those who want to refine the driving characteristics still further. Sadly, the car’s interior is mainly black with the odd dash of silver but there are optional colour inserts available for the seats. Standard equipment includes a 180 watt sound system, cruise control, Bluetooth interface and three-zone climate control. The car is available to order now for delivery in the Spring – priced at £43,870 otr. Obviously you get a lot of car for the money but prospective buyers, I would say, should be encouraged to investigate the car’s leasing options first. You could save a small fortune when depreciation kicks in with this beauty. This entry was posted in 4X4 Car, Car Updates & Releases, Family Car, New Cars, Sports Car and tagged audi, audi s, audi sq5, caption, car, car leasing, climate control, Cruise Control, LS, LV, price, seat, speed, Sport, sq5 tdi, SUV, TDI by Steve Lumley. Bookmark the permalink.